Mr. Entenmann threatens Bigberta with murder. A setback for Ulfkotte? The German Islamophobes are putting on a higher gear. tut auch Methylphenidat kaufen, dann ist vielleicht bald Ruh'." Translation: "Send a food-basket to Sonthofen, join a pig-ax to it, buy also Methylpenidate, then, maybe, everything will be quiet." The object of this call or invitation to murder, is Bigberta, who is living in Sonthofen (Southern Bavaria) and who is an active blogger against xenophobia at "Watchblog Islamophobie". Methylphenidate is a drug that is administered to (young) people who suffer from ADHD. A certain Mr. Wilhelm Entenmann from Mannheim is the author of this prose. Bigberta tried at first to engage in a debate with this person in the Watchblog. But when commenters on her blog and on the Kewil Blog started to attack her even more hatefully, she closed the discussion and announced to Mr. Entenmann, that he will be held responsible in Court for his ramblings. This creates an awful situation for Dr. Udo Ulfkotte. Although there is no direct link between him and Entenmann, as far as we can see, there is certainly one between Entenmann and "Politically Incorrect", the German anti-Islam Blog that was recently removed from the "Google News list'. "PI" is Mr. Ulfkotte's favourite source for his Islam-bashing postings. Entenmann is also a great fan of "PI", as we see on his blog. Will Ulfkotte succeed in strangling freedom of expression on the Web? I read a nearly desperate call of one of the bloggers who are persecuted in Germany by Udo Ulfkotte. The self-appointed Saviour of Europe (from Islam) wastes his time and money on legal quibbling against at least three German bloggers we know of, demanding huge amounts of money as compensation for alleged calumny. As always, he uses "Pax Europa" as his vehicle to bear the brunt of his expenditure on legal fees and lawyers, as well as the risk of his finally going out empty-handed. (Like in his legal actions against Belgian authorities who forbade the Brussels 9/11 demonstration). Ulfkotte's legal tactics have for consequence that individual antiracist bloggers are now in danger of being blooded to a financial death by legal invoices (from lawyers as well as from Ulfkotte and his Pax Europa Organization). It is a cause of principle: Freedom of opinion, freedom of linking to other people's opinions. The Internet is something different from traditional media. It is interactive. People who feel the need to contradict something, can react, either on the site of their "detractor", or on their own site, and link it to the original post. On the Net, it is no more like in the traditional printed-paper world. Legal provisions to protect individuals and institutions from slandering in the press, have historically been instituted to limit the abuse by mass media of their near-monopoly of the public sphere. This was done to correct a situation of unequal power, unequal access to the public tribune. The Net, however, is much more democratic: Anybody can publish, react, link, with about equal opportunity to reach the public and the public opinion. Therefore, everybody can, within the limits of the law, more freely vent his or her opinions and participate in the many dialogues that ensue. This is a fundamentally different situation from the one, the old press laws have been made in. Does this open the way to a so-called "liberty to offend", as claimed by many ideological allies of Dr. Ulfkotte? (Viz. the danish Cartoons debate!). We do not think so. Bloggers should take up their responsibility for consequences that their words and drawings may provoke. But nobody can upheld, that opening a discussion about racism, or hidden racism, in Dr. Ulfkotte's recent statements and actions, is irresponsible or provocative in the way, the Danish cartoons and similar systematic slandering of other people's deepest convictions are. But Ulfkotte, undermining the opinions of his allies, also in this matter, goes for exactly the contrary of "freedom to offend". He goes for Internet Censure by the Courts. The German Courts work with existing laws. Laws that date essentially from the printed-paper area. Laws that in the matter of press rules, have been sharpened after 1945, in order to avoid the kind of abuse, the Nazis made of the media. These laws need urgently an update for the 21st century. The actual legal situation allows anybody who has the financial means for it, to legally strangle other, less wealthy, bloggers, and to bleed them financially white with court fees and amends. Ulfkotte has started to exploit this loophole in German jurisdiction. He sues other bloggers for "Verleumdung" (defamation), when they call him a "racist". Even if they only link to an article where such things are written! In other countries, where legislation is not narrowed by post-1945 fears of nazist revival, an authority on Islam-Western relations like Olivier Roy, has been able to freely characterise as "racist" a maverick French philosopher (Robert Redeker), who wrote a perfectly "ulfkottean" article in the Paris daily 'Le Figaro'. (Olivier Roy in 'Esprit', November 2006 [FR]). That is why Germany urgently should modernize its legislation on the protection of personal integrity in the media, especially ont the internet. And that is why, if the German Courts would follow Ulfkotte's injunctions, an appeal to the European Court of Justice could well turn into a final victory for the attacked bloggers. That Ulfkotte abuses of these provisions that were originally intended to guard against new Nazism, in order to silence his critics from the antiracist left, is is proven by the fact, that he doesn't undertake anything against those who defame him from the right. (Examples in At Home in Europe, october 3, 2007). Such a behaviour has never been the intention of the legislators! German parliament and Courts should urgently undertake steps to correct the old provisions in order to make them applicable to the internet-epoch. Those, who stand up so vehemently for "the freedom to offend" (vide Danish Mohammed Cartoons debate, as well as Ajaan Hirsi Ali's statements to that effect), should also take action here against Ulfkotte and his organization. Freedom is indivisible. If Ulfkotte's anti-Islamist allies let him have his way against anti-racist bloggers, their turn will come next. So, the only thing that is left to do next, is to organise a public action of bloggers (from left and right) to make Ulfkotte and Pax Europa stop their legal advocacy against freedom of expression on the Net. On the 15th of November, in Frankfurt, a provisional hearing by the Court will decide about the procedure to follow. Time is short. 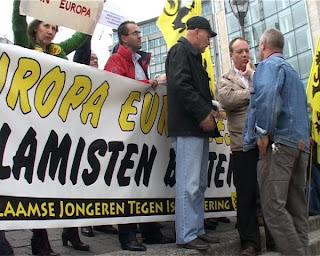 An appeal to the European Court should be envisaged, if German judges choose to follow Dr. Ulfkotte and his Pax Europa Verein. It is important, that German judges and legislators be aware of what is at stake, before the Frankfurt Court holds its preliminary hearings on November 15 in the first two cases of Ulfkotte advocacy against freedom of expression on the Web! My small contributions (see under 'roaming charges' in my Euroblogs, [EN], [FR], [DE] and [NL]) to the reform of European "roaming charges" (costs for appeals from and to mobile telephones in Europe from and to different countries/providers) have some reason to be celebrated: Finally, on September 30, all providers are obliged to apply the European maximum tariffs of 49 cts p/Minute for calling abroad, and 24 cts p/Minute for receiving an international call (Plus national VAT). This means a 60% reduction of consumer costs, coming too late for holiday roamings, but nevertheless welcome. The more so, while costs will continue to be capped at lower levels during the coming years. SMS- and GPRS (internet) roaming have still to be tackled. If providers do not limit themselves, measures have been announced this week in Brussels, to discipline them. The application of the caps comes also 3 months too late. It could have been applied on July 1st. That was the intention of the Commission and the European Parliament. Somehow, the providers managed to delay it during the three summer months, thus profiting from the consumers needs to call home during holidays. I myself, being a customer of the Belgian Proximus provider (an affiliate of the giant British Vodafone networks), received today an August bill of € 88.89 (21% Belgian VAT included). International and roaming calls are billed in it for about 0.75 € p/Minute (VAT not included). This in spite of the fact, that I am a member of Vodafone Passport, that allows lower tariffs if I call to or from Vodafone-affiliated networks in Europe. Otherwise, I would have had to pay still more. During our holidays (the August part), I called from Belgium to France, Spain and the UK; from France to Belgium and the UK; from Spain to Belgium, and the UK. And I received several calls from Holland, Belgium, the UK and Spain in different countries. Always via Vodafone Networks, where the Vodafone Passport is applicable. Also a middle price p/Minute of: 0,5878, which is 9,878 cts more per minute than it should have been. Calls received abroad: 2,04 Minutes at 0,8182 € = 0,4011 €. That is 16,01 cts more p/Minute than should have been billed. 73.43 x 9.878 + 2.04 x 9.878 = 725,34154 + 20,15112 cts = 745,49266 cts, or 7.45 €, which means: € 9.02 VAT included, or: somewhat more than 10% of my entire bill! Multiply by three months. This petty manoeuver, during three months, and multiplied by all other consumers' bills (except for corporations, who enjoy preferential tariffs since long), may have paid for the consultants and lobbyists Vodafone hired in 2005-2007, to counter the EU Commission's proposals with literally every possible counter-argumentation. The venerable Financial Times duly reported their ramblings, and was echoed by other media. All this shows, how necessary (and not at all impossible) it is, to regulate the "free" market with overall European regulations, as long as oligopolists try to profit from the remainders of compartimentalisation by country. (In this case: the fact that licences are being issued by national governments, who receive also the fees). I celebrate above all this proof of the capability of EU-cooperation, to get provider-consumer relations right on this issue. For the odds were not small: A formal, well financed campaign of big and smaller providers like Vodafone (GB) and France Telecom has been raging. But they did not prevail against Swedish Eurocommissioner Viviane Reding (EUobserver.com, October 2). This case is a weapon against Euroscepticism. It should be used. Europe's right-wing extremists show us, how to discuss differences of opinion in a way, compatible with European judeo-christian values. The invectives cited below, are undoubtedly part of the European Christian heritage, particularly that of the years 1922-1945. SIOE-England is good in inventing invectives. And, when SIOE burst out into the above philippica, it still had to undergo the treason by Udo Ulfkotte, who retired to Cologne at the last moment. No wonder, that SIOE-England and -Denmark replied to Ulfkotte's demand to share his costs for juridical action in Brussels, with an email, that Ulfkotte says (on the Pax Europa website), he "regrets not to be able to publish it, because of German laws for protecting identities". We demand freedom of speech on the internet! We issue an appeal to SIOE, to publish its mail to Ulfkotte. No backroom dealings between self-appointed leaders! Out in the Open, with it!